This colorful, lightweight aluminum walker with wheels folds easily. 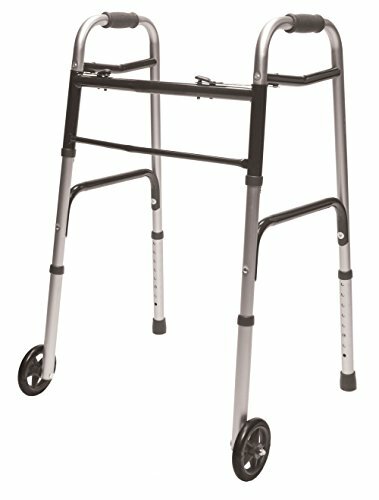 Adjustable walker includes 5"dia. wheels and rubber tips for rear legs. Walker height adjusts from 32"-39" with 16" between arms. Folds to 25" W x 4 1/2" D x 36" H for easy transport and storage. Lightweight walker weighs just 7 lbs. Supports up to 300 lbs. No express shipping. *Add $5 to shipping.